Cooking fires are the leading cause of home fires in the United States. But did you know you're three times more likely to have a kitchen fire on Thanksgiving than any other day of the year? With Thanksgiving upon us, "Early Show" Consumer Correspondent Susan Koeppen shared some "do's" and "don'ts" for handling a kitchen fire. She reported an entire house can go up in flames in just minutes from a kitchen fire. In fact, she said cooking fires kill more than 460 people each year, and cause more than $700 million in property damage. John Donovan, a researcher for State Farm Insurance, says all it takes is a few minutes of not paying attention to have a cooking fire start. Grease fires that get out of control, Koeppen said, are one of the main culprits. To see firsthand just how out of control they get, Koeppen traveled to the State Farm Building Technology Research Lab outside Chicago. Donovan, an expert in grease fires -- with fire fighters standing by, set a pan on fire to show what not to do when it comes to a kitchen fire. Donovan said, "I don't think most people are prepared to deal with a cooking fire in their home." Koeppen said, you might think water is the best defense -- but not when it comes to a grease fire. In the demonstration, when a Donovan threw a small cup of water on the pan, the flames doubled in size almost instantly. Donovan said, "The worst thing you can do with a grease fire is put water on it." And when Donovan tried to smother the fire with a wet towel, the fire, again, grew more intense. Donovan said, "There is the potential to not get (the towel) on all the way. There is the potential to drag that pot off the stove." But are fire extinguishers the answer? Not always. Using a water-based fire extinguisher can have disastrous results. In the demonstration, flames shot to the ceiling when a water-based extinguisher was applied. But what you can do is use a dry-chemical fire extinguisher, specifically designed to deal with grease. Donovan also suggests, if the flames are small enough, that you carefully put a lid on the pan and turn off the heat. And once that lid is on, don't remove it. Donovan said, "As long as that burner's on, it's going to continue to heat that fire. It's going to continue to heat that oil. It's very important to get that shut off." If a grease fire is left alone -- even for a few minutes -- your whole kitchen can go up in flames. In their experiment, Koeppen and Donovan let the pan burn. Within 30 seconds, the flames had reached the vent. At one minute, the cabinets were on fire. At two minutes, the stove and cabinets were fully engulfed and flames were at the ceiling. At three minutes, firefighters had to extinguish the fire. Donovan said, "Within 10 or 15 minutes, you have a fully engulfed kitchen. It happens very quickly." 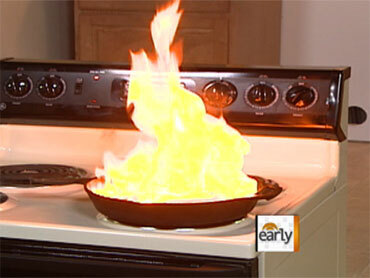 Koeppen added on "The Early Show" that you should never carry a burning pan out of the house. And if you have an oven fire, the best thing to do is turn off the heat and keep the oven door closed. She continued, "Obviously, don't leave food that's cooking unattended and call 911 if you have a fire." As for using baking soda on a fire, Koeppen said it can put out a fire, but it's not recommended. Baking soda, she said, needs to be applied in a very specific way and in the right amount to be effective. Tundra: Spray bottle that's easy to use. $25. Home Hero 5BC: This one is a small kitchen fire extinguisher, it's white and blends in with the kitchen and it's $30. Kidde ABC: This is the more traditional fire extinguisher, it says ABC on the side which means it's good for all fires including a grease fire and it's $39.